Commissioner Johnson has been a long time resident of South DeKalb County for over 30+ years. During that time, she has built and cultivated relationships that have gained her the respect of the community both personally and professionally. On July 14, 2015, she was elected to serve the DeKalb County Commission, District 5, filling a 2 ½ year vacancy. She hopes to bring a spirit of leadership, family, and collaboration to help renew DeKalb County and to selflessly serve the over 140,000 constituents in her district. Commissioner Johnson has been a practicing attorney for more than 33 years, concentrating in the area of family law. In 1985, she became the first black female judge appointed in DeKalb County Courts. At the time of her historic appointment, she had practiced law for less than three years. Commissioner Johnson is a co-founding partner with the law firm of Johnson Hopewell Coleman, LLC. The Commissioner holds a Bachelor of Arts degree and a Master of Arts degree from Tennessee State University. She obtained her Juris Doctorate from the Thurgood Marshall School of Law at Texas Southern University in Houston, where she met her law and life partner, Congressman Hank Johnson. She is the co-founder and past president of the DeKalb Lawyers Association, which she continues on as a volunteer. 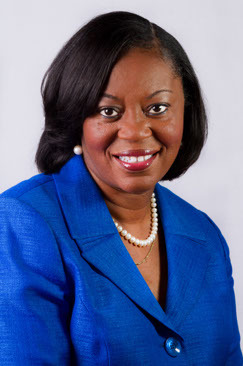 She formerly served on the Board of Directors of DeKalb Hospital Authority and the Georgia Democratic Committee, serving as a member at large. She is also a former Board Member of the Congressional Black Caucus Foundation, Inc., Georgia Legal Services, Inc., and has served as a volunteer lawyer for Decatur Cooperative Ministry. Currently, the Commissioner is a member of the Congressional Spouses Club and the Congressional Black Caucus Spouses, where she served as chair for four years. Commissioner Johnson and her husband, Congressman Johnson have been married for over 35 years. They are the proud parents of two children.